Your waterproof deck provides you and your family with an extended outdoor living space and a quiet area to take in nature, but it’s also vital to consider that aspects of your vinyl deck are there to protect your home from the elements. Any deck is also an investment in your home, so you want it to look great as well as continue offering a waterproof barrier to the elements. 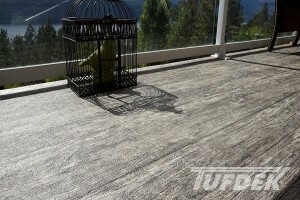 Tuff Industries has pulled together the following waterproof deck tips. There are a few things you can keep an eye on to ensure that your deck isn’t heading down a road towards damage to the surrounding structure. For example, when there’s a significant rain, or when the snow melts, are there puddles of water on your deck? Does the water on your deck run off the deck, or towards your house? These simple factors can be early signs that your deck is in danger of losing its waterproof properties. Finding small problems before they become big problems will save you a ton of hassle. During regular maintenance, after removing dirt and debris, give your deck a thorough once over. You’ll want to check for loose edges, warped or bubbled areas, as well the seal against your house. If you have any issues, have a professional inspection completed, as it might just be the tip of the iceberg. If you have any suspicion that your deck is 1) no longer waterproof, 2) close to failing or 3) needs a regeneration then it’s the time to install a new waterproof membrane. A vinyl deck membrane offers several benefits, in addition to protecting your deck and home. Railings are another ingress point for water to enter your deck, the underlying structure, or to flow unknowingly towards the home’s envelope. They are also an important safety feature, but almost as important is how they finish your deck and can add to, or subtract from, the overall feel. Vinyl deck railings can greatly improve esthetics and replace older deck railings. What you put on your deck surface is almost important as the deck membrane itself. Although vinyl deck membranes are scratch and gouge-resistant, you don’t want to drag anything across the surface that could potentially scratch through the membrane and reduce its waterproof abilities. Likewise, you don’t want to leave anything on the deck that could stain the surface or corrode the membrane – so check under pots and other stationary items to ensure they aren’t causing problems. In the end, a new waterproof deck membrane can alleviate a lot of problems – particularly a high-grade decking material like Tufdek™. Consider replacing your current deck or covering it with a new waterproof vinyl deck that will last you for a few decades, so you can enjoy your deck more, and worry about it less.